What do Presidents Bill Clinton, George Bush and Barak Obama have in common? They all promised to enact the Jerusalem Embassy Act of 1995, yet none of them ever did. On November 8, 1995, US President Bill Clinton signed the Jerusalem Embassy Act of 1995 into public law. This Act recognized Jerusalem as the capital of Israel, called for Jerusalem to remain an undivided city and mandated that the US relocate its embassy to Jerusalem by May 31, 1999. However, a technicality gave the president the discretion to invoke a six-month waiver on the application of the law under the guise of “national security.” Despite Bill Clinton’s promise to move the US Embassy, he reneged on this promise, as did George Bush and Barak Obama over the course of the next twenty-two years. President Donald Trump finally followed through on the promise made by President Clinton, and what was the response? Fake outrage and distortion of the facts. 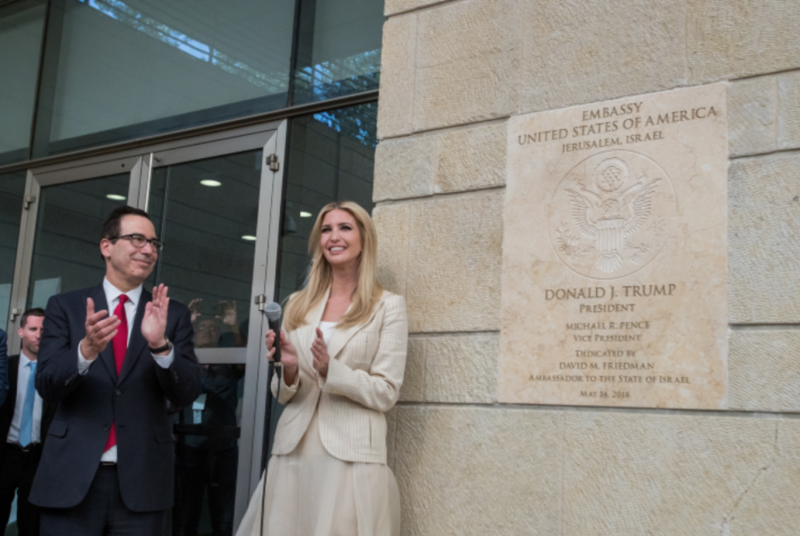 We have been repeatedly pounded by traditional media’s fake narrative regarding how peaceful, innocent protestors were ruthlessly murdered by Israeli forces because Trump moved the embassy to Jerusalem. But has the fake media uncovered the true story? In fact, on May 16, Salah Al-Bardawil, a senior member of Hamas’s Politburo, revealed on Palestinian television that 50 of the 62 Palestinians killed in the rioting were members of Hamas. It is important to remember that Hamas is deemed to be a terrorist organization by the United States and other governments. In 1997, Secretary of State Madeleine Albright designated Hamas as a Foreign Terrorist Organization (“FTO”) in accordance with section 219 of the Immigration and Nationality Act (“INA”). Shortly thereafter, the European Union and Israel as well as numerous other countries and international organizations designated Hamas as an FTO. So why did Hamas’s leaders send rioters and agitators armed with knives and sling-shots into a heavily armed border area to take on one of the best armed, highly trained counter-terrorism forces (the IDF) on the planet? The answer is simple—it’s standard operating procedure for the terrorist organization. Hamas typically uses women and children as human shields to create “bloody photos and PR.” And the fake news organizations eat it up. Many pundits are now claiming Hamas won the public-relations war following the global media coverage of the deaths. Even though the fake news organizations claim outrage over the deaths, is that what’s really behind the negative news coverage over the riots and “President Trump’s decision to move the US embassy?” Is it really over concern for the “innocent” lives lost in the attack orchestrated by Hamas? The fake media and the deep state are not actually doing anything new with their reaction to the riots. They are just continuing with the same agenda they’ve held ever since Trump was elected. Bad actors, whom I have mentioned in my previous Guardian articles, in the Obama administration, the US Congress, the FBI, the NSA, the DOJ and the CIA have, since Trump’s election in 2016, created a criminal plot to exonerate Hillary Clinton and to impeach President Donald Trump based on false evidence. It appears likely that some of these bad actors will be indicted soon. They are trying to conflate the deaths of Hamas terrorists into their agenda by calling them peaceful protestors who died because of Trump’s enactment of the Jerusalem Embassy Act of 1995. The heavily biased, dishonest media have enabled and pushed forward these false narratives on behalf of these bad actors to divert attention away from the imminent release of Inspector General Michael Horowitz’s report—areport from which Horowitz will likely forward criminal referrals to Utah’s US attorney John Huber as early as next week. How the DOJ and FBI conspired to exonerate Hillary Clinton before interviewing Clinton and her closest associates. How officials from the Obama administration and senior members of the NSA, the FBI and the DOJ abused power and lied to several United States Foreign Intelligence Surveillance Court Judges to illegally obtain FISA warrants to spy on a political opposition campaign with the specific goal of undermining the opposition party’s presidential campaign of 2016. The Obama State department’s illegal “unmasking” of American citizens. The criminal plot by the Obama administration, the NSA, the FBI, the DOJ and the CIA to delegitimize the Trump Administration and to suborn the Presidency of the United States via Robert Mueller’s illegitimate witch-hunt. The US’s traditional media have given up any attempt at investigative journalism and now just push their own agenda. The “resistance” now defends Hamas terrorists, murderous MS-13 gang members illegally in US sanctuary cities and ANTIFA anarchists who prevent free speech and beat peaceful protestors because they disagree with their opinions. The deep state, along with the fake news organizations, and the Democratic resistance party are willing to do whatever it takes to move their agenda forward and oust Trump—even if that means supporting MS-13 gang members and or terrorists.